Automatic doors, ECUs & Ability Switches including Ez COMM ATS. ABOUT Barrier Free Access Systems in Long Island, New York and Connecticut, New Jersey and Pennsylvania. 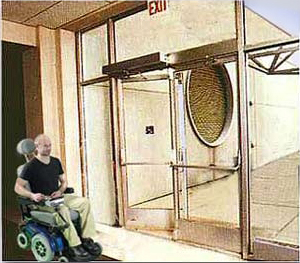 Barrier Free Access Systems has been providing fast and effective automatic door and disabled access device service to the NY, NJ, CT and Penn. communities since 1991. When you call Barrier Free Access Systems you can rest assured that you'll receive the best recommended products and services available. We offer a wide range of automatic door openers, ECUs and other architectural, mechanical and electronic devices to aid homeowners, health care facilities and businesses to increase and maintain their access for people with disabilities. Whether you need advice on a new installation or equipment, or your automatic door needs a yearly check-up, small repairs, or a complete overhaul, you can trust a Barrier-Free Access Systems automatic door service technician to complete the job promptly and effectively. Barrier-Free Access Systems, Inc. is a specialty technology equipment dealer and installer, providing disabled access of the physical environment with automatic door openers, environmental control units and modular, portable and threshold ramps.